2008 Kia Rondo, V6 Starts in an instant EXCEPT when at gas station for a fill up. Takes over 30 seconds of cranking, stalls 2-3 times and runs crappy for about one minute. Very repeatable. Is the gas cap part of the computer system? Thanks for advice. Make sure your gas cap is in good condition and don't try to top off the tank. Is there a smell of gas in the back seat or trunk? It sure does. It sounds like it's venting the charcoal canister and fuel tank way before it should. Need to have a look at what the canister/tank purge system consists of and then go from there. Check too that the canister hasn't been fuel soaked - that kills them pretty quick. I saw on a TV court case where a shop told a Volvo owner that his loose gas cap had cause his something something pump to run all the time and that caused it to burn out and set the check engine light. By the time I got to the conputer, I forgot what the first two words were. Do you or does anyone here know the things full name? Does this sound believable. He said the pump was meant to increase or maybe equalize air pressure in the gas tank. A leaky gas cap causing an electric motor to burn out? Sounds like a bunch of hogwash to me. I was working on my daughter's Jeep Cherokee today in the hot tropical sun and the thought occurred to me that it will be a great day when cars are el ectric and I won't have to look for vacuum leaks and replace emission contr ol sensors/valves. All this will be over like some bad dream. 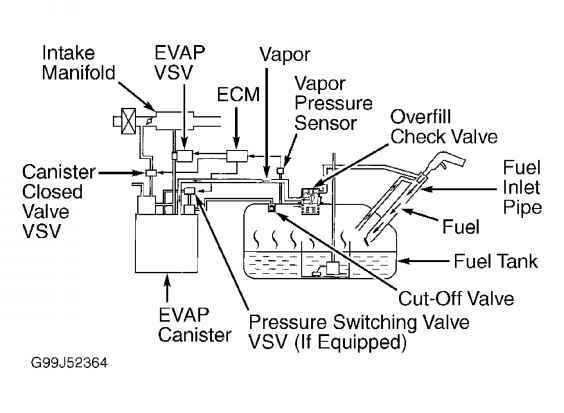 It's Part of the EVAP (aka Evaporative Emission Control System), and tests the fuel tank to make sure it can maintain pressure and vacuum at certain levels, which means fuel vapor (fumes) won't escape. It's not a typical spinning-electric-motor type of pump, but a set of solenoids, diaphragms, valves, and orifices that are activated by the ECU. Close the external air vent, open some vacuum ports, and measure how fast the tank gets sucked down to a set level. Open/close other valves, then pulse the diaphragms to slowly pressurize the tank, and measure that. If the readings don't change fast enough, or stay steady long enough, the system assumes there's a leak, and the Check Engine light will turn on. Cars are usually only tested once per "warm-up cycle", and only for a few minutes, so all leaving the gas cap loose does is set the light, not "burn out" the not-really-a-pump. Your system should be similar. Check out the purge control solenoid valve. They tend to stick open and flood the system. You could try full throttle (clear flood mode - reduced fuel delivery at injectors) when starting and if it starts a shade more easily, then the purge control solenoid valve or its upstream circuit should be looked at. Bad purge solenoid. It is in the engine compartment near the intake manifold and allows the engine to draw off the collected vapors from the charcoal canister. When they stick open the action of filling the gas tank drives the vapor up into the intake manifold and you end up with such a rich mixture that the engine won't start. Very common failure and symptom. Youtube Kia Rio Purge Valve Replacement Procedure ...Somebody at kia-forums.com said those valves tend to stick partially open/whatever. Just as well to install a new one. Is it a sign that it is a battery problem if it is difficult to start a car in a hot or humid day? XJ 8 Difficulty starting from cold. Is There a Fix to My Starting Issues?